What a tangled web of water and water ice stories on Mars. There’s likely some underground. There’s definitely some at the north pole. And we are pretty certain water flowed there in the ancient past. But what about surface water today, right now, in the view of our many orbiting cameras at the Red Planet? One hotspot of debate are flows called “recurring slope lineae”, which are features that appear in warmer temperatures. These would seem to imply some kind of briny water flowing. A team recently checked out 13 of these sites. While they didn’t find any water or salt evidence in the spectra, they did find more iron-bearing minerals on “RSL slopes” compared to those that aren’t. So what’s going on? “We still don’t have a smoking gun for existence of water in RSL, although we’re not sure how this process would take place without water,” stated Lujendra Ojha, a graduate student at the Georgia Institute of Technology in Atlanta who led two reports on these features. Pictures were taken using NASA’s Mars Reconnaissance Orbiter’s High Resolution Imaging Science Experiment (HiRISE), which is led by the University of Arizona. It’s possible that the grains are being sorted by size (more plainly speaking, taking the fine dust away and leaving the larger grains behind), which could happen either with water or without it. Or, water might be present but not in a way that is obvious immediately if the area got darker because of moisture, or the minerals became oxidized. Water could be “missing” from these observations because they took place in the afternoon (meaning they could miss morning dew), or because the dark flows are smaller than the sample size in the picture. While researchers still aren’t sure, the team says they still believe it’s salty water of some sort that is flowing despite very cold temperatures on Mars. 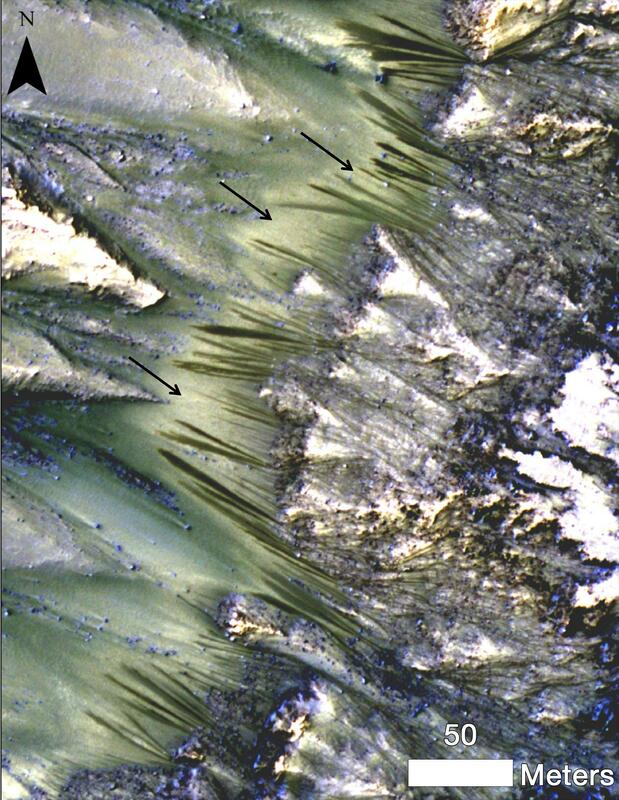 “The flow of water, even briny water, anywhere on Mars today would be a major discovery, impacting our understanding of present climate change on Mars and possibly indicating potential habitats for life near the surface on modern Mars,” said Richard Zurek, MRO project scientist who is at NASA’s Jet Propulsion Laboratory in California. A related paper also found that RSL sites are rare on Mars, appearing in only 13 of 200 sites surveyed with similar slopes, latitudes and other features. You can read the accepted versions of the reports as they appear in Geophysical Research Letters and Icarus. Too bad we didn’t land curiosity near one of those spots. As I understand it, and I’m not sure if I’d prefer being wrong, or right, about this; there are places on Mars NASA won’t land for fear of contaminating the landing site with Earth flora/fauna. I might understand that rationale but at the same time, if true I would be furious that any chance of discovery was passed up. Bureaucrat make poor leaders. Scientists who become bureaucrats should retire to Point Barrow, or Thule. Previous PostPrevious Virtual Star Party – February 9, 2014: Fire is Bad for Seeing!